Most Mac users know when you purchase a Mac, it comes with Apple’s own set of bundled software. The software ranges from Mail (Email Client) to iMovie (Movie editing software) and of course iTunes (Media library viewer). The bundled software is a great way for Apple software to be integrated in the end users life. After all, their software is integrated within itself, once you have created a movie in iMovie, send it over to iDVD to burn the DVD or why not send it to iTunes, so you can sync it with the iPad you purchased with your iMac. But we digress, Mail for the most part has been apart of Mac OS X. It’s the built in email client designed by Apple, and after the release of Snow Leopard, has allowed Microsoft Exchange support. With the ability of Exchange support, it allows Mac OS X users to use their Mac to retrieve and send email hosted through their work, without having to install products such as Microsoft Office for Outlook or Entourage depending on the version. In my opinion, Microsoft Office was created better on the Mac than on Windows. Let’s dive into Mail 5, Apple announced that the new redesign of their Mail application. If you use Mail on the iPad, it looks very similar. After all, it’s about “The power of the Mac. The magic of the iPad.” The new Mail sports a mail bar with many of the features of the iPad along with full-screen support. 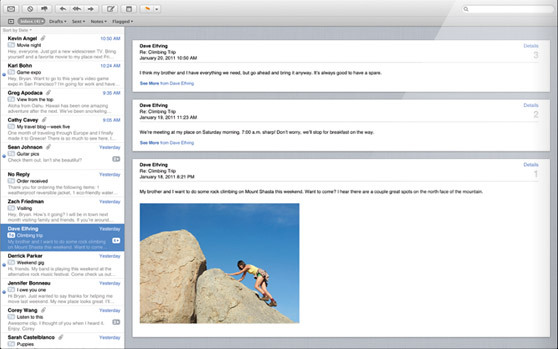 Additionally, Mail brings the concept of “Conversations” to the Mac. Conversations look very similar to the threads that Apple has introduced on the iOS. This looks like a very Gmail inspired feature that I find very helpful, but a times annoying. What do you think about the new redesign of Mail in Lion? Leave a comment below, stay in the loop, follow us on twitter @realmacgenius!